Wildflower Strikes Again | No Soap, Radio! I confess, I wasn’t trained. 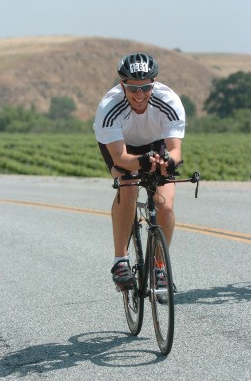 Since doing the WF Long Course last year (2007), I only got out on my road bike twice so I was bracing for the worst. Despite just a couple trips to the pool in the last few months, I was able to click off a pretty good swim. I have no explanation for my surprising bike split. I managed a full 8 minutes faster than last year and all I can think is that either my homespun yoga (strength??) or a relaxed attitude led me to be more patient and efficient. 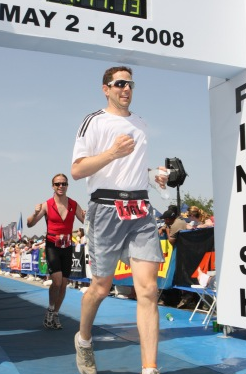 I was out of T2 with a time of 3:55 and actually believed that I might make a bit of a performance jump. The first 4 miles went well and then that classic Wildflower hight eighties heat set in and I faded hard. Amazing by mile 7, I could see that magical 6:20 time chasing me down. So here you go, over the last four years, my times have been just 3:30 apart over 70 miles and 3 disciplines. Go figure!